In the era of “Bird Flu”, “Mad Cow”, and “Chronic Wasting”, people want to know where the food they’re eating comes from. It’s a very good question, one that you should ask yourself, and one that I received recently. Here at Usinger’s, we do not “harvest” animals, never have. We buy only the preferred cuts from USDA inspected packinghouses located in Wisconsin and other Midwestern states to make our sausages. Because our suppliers are under continuous inspection by USDA Food Safety and Inspection Services (FSIS), they must comply with Federal Regulations related to animal welfare, animal health, proper sanitary conditions and that the entire process is conducted humanely. Federal Law requires that FSIS personnel be present during hours of operation at these establishments to validate compliance. We have always believed in using only the freshest and highest quality ingredients. 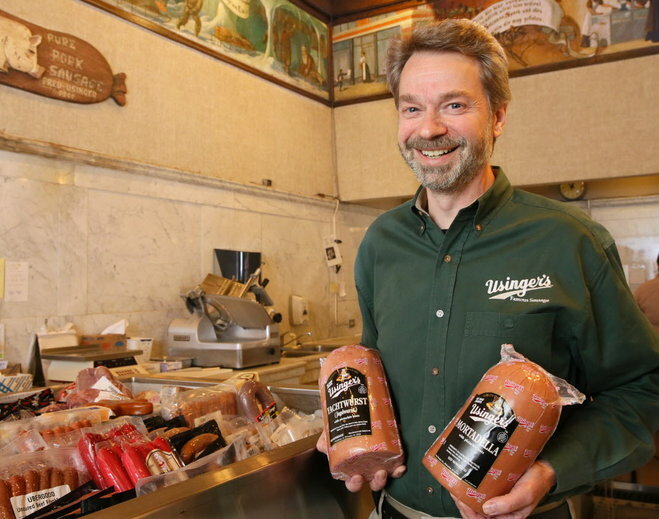 We do not use imported frozen meat in any Usinger products. Fresh, Midwestern pork and beef that is delivered daily to our Third Street sausage kitchen is what you will find in our products. It’s the only way to make America’s finest sausage.